﻿ The 35th annual running of the Waste Management Susquehannock Trail Performance Rally® (STPR®), presented by Citizens and Northern Bank returns to Wellsboro, PA with a refreshed event format and plenty of spectator opportunities. 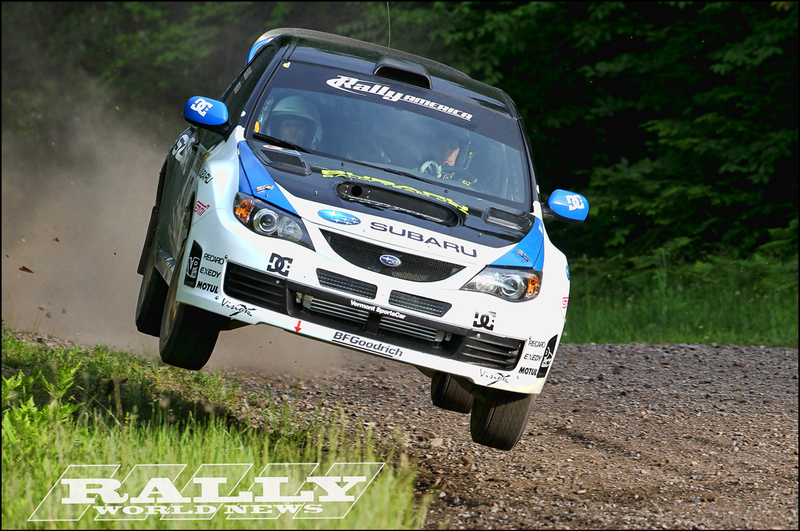 As the oldest, continuously-running motorsports event in Pennsylvania, the 2011 STPR event, which is round five of the Rally America Championship Series, will take place June 3 and 4, 2011. The rally, promoted by the Finger Lakes STPR Motorsports LLC committee, is pleased to announce that the racing stages at the Tioga County Fairgrounds is now being combined with both a Friday and Saturday appearance of the cars on “the Green” in the center of Wellsboro, PA.
“We have brought that back by instituting a Parc Expose – an open exhibition of the cars – on the Green at noon on Friday for the traditional viewing and ceremonial send-off into the Waste Management territory for the timed racing stages, plus a revival of the Saturday morning send-off from the Green as well,” said Croucher. The Fairgrounds stages cost five dollars for admission each day, with event tickets on sale in advance at the Wellsboro Chamber of Commerce (info at 570-724-1926). One of the other changes made several years ago – the transition of STPR to an alcohol-free event – has helped enhance the family enjoyment of the rally for everyone, and made the administration of the event, both in town and in the woods, easier. More than 40 race cars, the infusion of thousands of dollars to local area businesses rivaling a national convention, and Rally America championship points chase all highlight the arrival of STPR to the state forests near the Pennsylvania Grand Canyon, again announcing the coming of spring in Tioga County. With Waste Management, plus Citizens and Northern Bank and the Wellsboro Chamber of Commerce sponsorship of the event helping to defray overhead expenses, the STPR Committee is able to offer the rally to the area at little or no cost to the community. Besides the 400 volunteers who work the rally – many of whom come in from out of town and use local services - another estimated 10,000 people come to the Wellsboro area either as spectators or workers for the various teams and their sponsors. After last year’s sold-out STPR VIP Super Pass, the Committee is continuing its expanded spectator option to include separate Friday and Saturday programs for those who might not be able to do both days. Starting Friday afternoon with the Waste Management stages, where you will be escorted to a private viewing area, to Saturday afternoon, when a bus will take you to a secluded, private area to watch the Pennsylvania Grand Canyon stages, you can get a view of the action previous reserved only for the working media. Food and drinks will be served, and VIP Super Pass holders will receive special rally mementos. Bring your camera for even better photos than before. Plus, there will be VIP seating for the stages both Friday and Saturday nights at the Tioga County Fairgrounds. Bus transportation will be provided to and from the Fairgrounds to all points. All this for only $50.00 per person per day – kids are not free, as the number of VIP Super Passes are limited. Pick them up today at the Wellsboro Chamber of Commerce and Tioga Publishing Company, or call 570-724-1926 for additional information. The Waste Management Susquehannock Trail Performance Rally®, presented by Citizens & Northern Bank, is a National Rally, approximately 300 miles long with approximately 128 miles of competitive stages. The Sherwood Forest Rally is a Regional Rally (for competitors who are not running for national Rally America Championship points), coefficient 2 that includes Stages One through Six and is approximately 48 miles. The Finger Lakes Rally is a Regional Rally, coefficient 3 that includes Stages Seven through Ten and is approximately 80 miles – both Regional rallies are run in conjunction with the full national event. On Friday, June 3, the 22th annual Relay for Life street rally will take place in conjunction with the STPR event. This year’s event will benefit the Tioga Country chapter of the American Cancer Society, and is opened to the general public. A time-speed-distance rally designed for any legal vehicle, within the legal speed limit, on high quality paved and unpaved roads in Tioga County. This event will not use the forest roads of the Performance Rally. The instructions will have a mileage to each turn, and are intended to be easy to follow. There are no tricks or traps involved in following the course. Awards in four classes: Novice (less than six (6) rallies by anyone in the car); Stock (stock odometer & single memory calculator); Limited (any equipment which cannot accumulate time and distance simultaneously, including non-programmable calculator, relocated odometer, - SCCA class "L" equipment; and Equipped (anything goes). Door Prizes, too. No limit to the number of people in each car. Limited to the first 50 paid entries. Registration for the charity rally is from 11:00 a.m – 1:00 p.m., with a class for newcomers to time-speed-distance road rallying at 12:30 p.m. – all at the Tioga County Fairgrounds. There is a mandatory drivers meeting at 1:00 p.m., and the three-hour event starts at 1:31 p.m. the fee for paid, pre-registered competitors is $35/car before May 25, and $40/car after that. More information can be found at http://www.stpr.org/.